The Amari Orchid Resort’s Ocean Tower has many places to eat, indoors or out. Mantra brings you something very special. From seven open-to-show kitchens comes an exciting choice of world cuisines: Japanese, Chinese, Thai, Indian, Mediterranean, Western, or gourmet fresh seafood. All-day dining is to be found at Essence, laid-back and relaxed. The Horizon Club Lounge serves a buffet breakfast, refreshments all day, and cocktails with hors d’ oeuvres in the evening – exclusively for Horizon Club members, of course. The Ice Bar is truly chilled-out, with signature cocktails and Asian tapas served from early till late. Elsewhere, you can dine al fresco, breathing in the sea air, whilst surrounded by a landscaped tropical garden. The food is gourmet Asian, the style is casual. 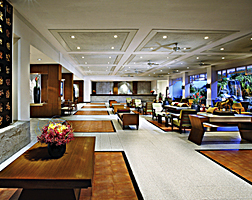 The Lobby Bar is open from early till late, with a great range of refreshments and snacks, a very relaxed meeting place. There’s a Pool Bar at each wing, open till late afternoon, serving tasty snacks and fruit punches, amongst other things.